Milk Prices: Where are we now and where are we heading? In the last issue, the Class III component price for May and June were similar at $15.18 and $15.21/cwt, respectively. For the month of July, the Class III future was projected to rise slightly to $15.36/cwt and then decrease over a $1/cwt to $14.08/cwt in August. The Class III component price for the month of July actually closed at about $1/cwt lower than its future at $14.10/cwt, whereas the August Class III component price closed higher than its future price at $14.95/cwt. Class III futures for September are about the same at $14.85/cwt, followed by a $1.50 jump in October to $16.33/cwt. For almost 4 years now, the annual Class III milk price has averaged around $15 to 16/cwt (4 year average of $15.32/cwt). Compared to the record year of 2014 (year average of $22.30/cwt), this price is obviously a disappointment. The low price is simply because average milk production and cow numbers keep growing. Back in 2014, production averaged 22,260 lb/cow/year with nearly 9.34 million cows in the U.S. As I write today, average production is just over 23,360 lb/cow/year with over 9.40 million milk cows. Doing the math, this amounts to a 5.8 million ton difference in annual milk production between 2014 and today – has the demand for dairy products gone up that much as well? The answer, no. For the milk price to go back up, cow numbers need to decrease. The USDA does expect cow numbers to come down in 2019, but this will be a slow process. This being said, the average Class III average price will probably continue to go down and be in the $14.50 to15.50/cwt range for the remainder of this year and maybe even the first part of 2019. Times will continue to be tough for dairy producers. As in previous issues, these feed ingredients were appraised using the software program SESAME™ developed by Dr. St-Pierre at The Ohio State University to price the important nutrients in dairy rations, to estimate break-even prices of many commodities traded in Ohio, and to identify feedstuffs that currently are significantly underpriced as of September 25, 2018. Price estimates of net energy lactation (NEL, $/Mcal), metabolizable protein (MP, $/lb; MP is the sum of the digestible microbial protein and digestible rumen-undegradable protein of a feed), non-effective NDF (ne-NDF, $/lb), and effective NDF (e-NDF, $/lb) are reported in Table 1. Per usual, commodity and nutrient prices have went down as crops are being harvested in the majority of the Midwest. For MP, its current value has dropped $0.05/lb, from July’s issue ($0.40/lb) and is about 38% lower than the 5 year average ($0.48/lb). The cost of NEL is also lower than July (9¢/Mcal) and lower than the 5-year average (11¢/Mcal). The price of e-NDF and ne-NDF are not very different from July at 8¢/lb and -6¢/lb (i.e., feeds with a significant content of non-effective NDF are priced at a discount), respectively. Needless to say, now would be a good time to start locking in good prices on commodities and reformulating rations to enable feeding bargain feedstuffs long term. In this issue, I also calculated a new corn silage price for the 2018 growing year: $44.60/ton (35% dry matter). This price is about $1.40 more than the 2017 growing year ($43.20/ton) but is still a bargain compared to other common ingredients. The price I calculated is based on the crop value as if it was harvested for corn grain rather than silage. Because corn silage is dual purpose and provides marked amounts of both NEL and e-NDF for dairy cows, the true value of corn silage to the producer should actually be around $66.60/ton, about 50% higher than my calculation. However, corn silage quality varies considerably based on location (e.g. weather and growing conditions) and harvesting and storage conditions, as well as the corn hybrid planted. 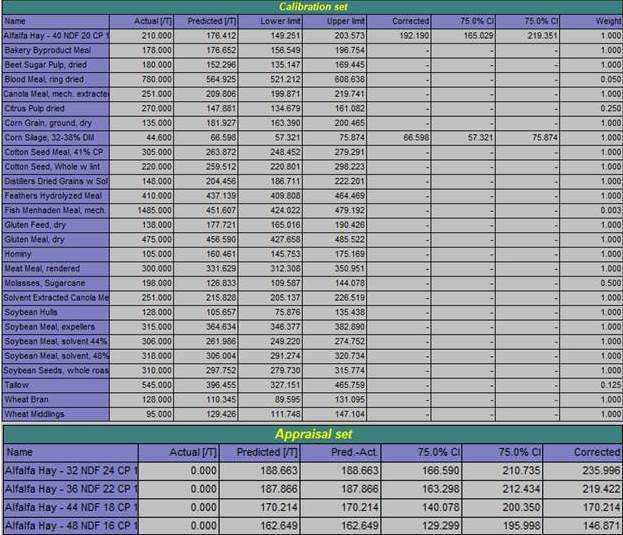 Using the 75% confidence intervals defined in Table 2 are better predictors of what corn silage may actually be worth to producers because of this real world variability. The intervals still do not contain the calculated value based off corn grain (i.e., the $44.60/ton estimate). Bottom line, corn silage should be a no brainer for making up the majority of the forage component for rations during the upcoming year, but only if you have stored enough – running out of corn silage in August will be a huge financial burden. 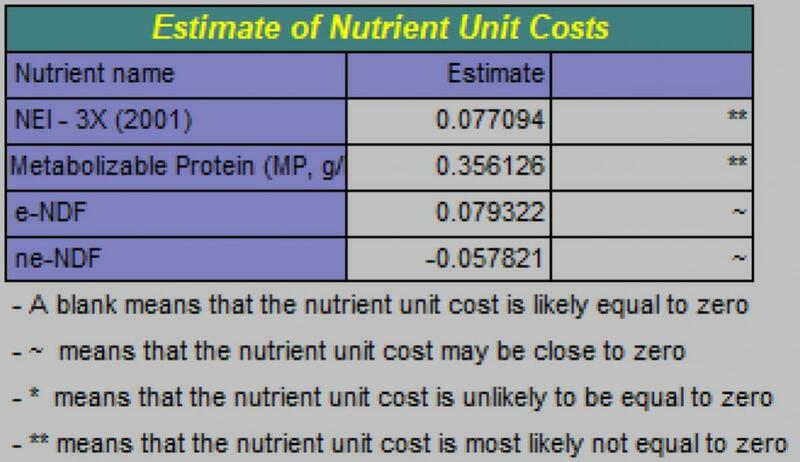 To estimate the cost of production at these nutrient prices, I used the Cow-Jones Index for cows weighing 1500 lb and producing milk with 3.7% fat and 3.1% protein. For this issue, the income over nutrient costs (IONC) for cows milking 70 lb/day and 85 lb/day is about $9.15/cwt and $9.53/cwt, respectively. These IONC may be overestimated because they do not account for the cost of replacements or dry cows; however, they should be profitable when greater than about $9/cwt. The IONC for September are also better than July ($8.41/cwt and $8.85/cwt, respectively). Overall, profits for dairy farmers in Ohio are marginal to breaking even. Table 1. Prices of dairy nutrients for Ohio dairy farms, September 25, 2018. Results of the Sesame analysis for central Ohio on September 25, 2018 are presented in Table 2. Detailed results for all 27 feed commodities are reported. The lower and upper limits mark the 75% confidence range for the predicted (break-even) prices. Feeds in the “Appraisal Set” were those for which we didn’t have a price or were adjusted to reflect their true (“Corrected”) value in a lactating diet. One must remember that SESAME™ compares all commodities at one specific point in time. Thus, the results do not imply that the bargain feeds are cheap on a historical basis. Table 2. Actual, breakeven (predicted) and 75% confidence limits of 27 feed commodities used on Ohio dairy farms, September 25, 2018. Table 3. Partitioning of feedstuffs, Ohio, September 25, 2018. 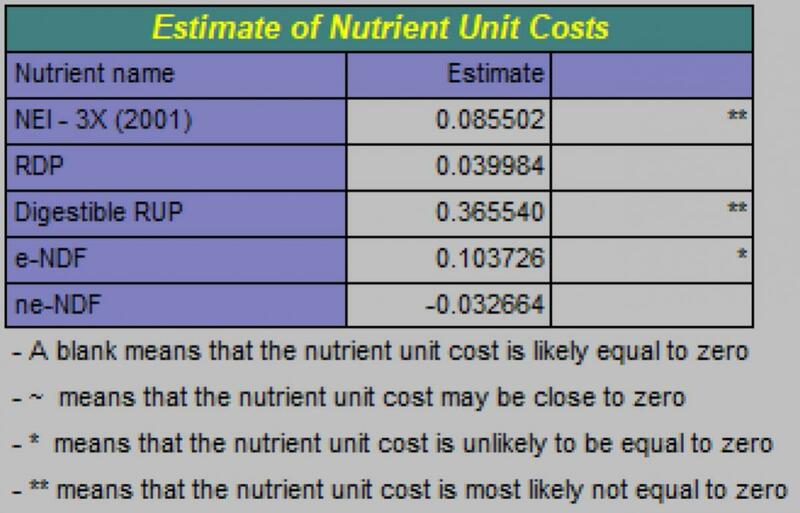 For those of you who use the 5-nutrient group values (i.e., replace metabolizable protein by rumen degradable protein and digestible rumen undegradable protein), see the Table 4. Table 4. Prices of dairy nutrients using the 5-nutrient solution for Ohio dairy farms, September 25, 2018.